There have been varying treatments of the sub-specific taxa within this species over the years; some have been considered full species at times (Nolan et al 2002). Current authors (Pyle 1997, Nolan et al 2002, Clements et al 2016, Gill and Donsker 2017) divide the taxa into several groups but vary as to which taxa are included in each. Herein, we treat the subspecies in groups as follows: (1) slate-colored group: hyemalis, carolinensis, (2) cismontanus, (3) Oregon junco: oreganus, shufeldti, montanus, thurberi, pontilis, pinosus, (4) pink-sided junco: mearnsi, townsendi, (5) gray-headed junco: caniceps, dorsalis, (6) white-winged junco: aikeni, and (7) insularis. The Nebraska representatives of each group will be discussed separately, except for insularis, which is found only on Guadalupe Island, Mexico. Mila et al (2007) studied diversification in the genus Junco using mitochondrial DNA; their results supported a hypothesis of expansion from the south involving yellow-eyed juncos, followed by rapid diversification of derived dark-eyed juncos in the north. These results suggest that rapid expansion post-glaciation (Last Glacial Maximum) into previously unoccupied regions that leads to rapid diversification may provide a speciation mechanism alternative to “traditional modes of Pleistocene speciation”. Junco subspecies are not uniformly distributed across the state in winter as all but slate-colored occur in higher proportions in central and western Nebraska based on CBC data (Table 1, see below). Table 1. Total number and percentages of different junco subspecies (cismontanus not included) recorded on Nebraska Christmas Bird Counts (CBCs) in western, central and eastern Nebraska during the years 2006-2007 and 2014-2015. Status: Abundant regular spring and fall migrant and winter visitor statewide. Documentation: Specimen: UNSM ZM7380, 16 Oct 1907 Lancaster Co.
Taxonomy: Subspecies hyemalis breeds from Alaska east to Newfoundland and south to south-central Alaska, northeast British Columbia, and from central Alberta east to Pennsylvania, New York, and southern New England, wintering mainly south of breeding range and east of the Rocky Mountains south to northern Mexico and northern Florida (Pyle 1997). Nebraska birds are hyemalis. Most depart by mid-May, although peak migration is in late Mar-early Apr; it was “abundant” in Saunders Co 12 Mar-18 Apr 1994. Later reports are 11 Jun 1973 McPherson Co, 11 Jun 1981 Garden Co, 14 Jun 1960 Scotts Bluff Co, and 16 Jun 1974 Lancaster Co. One that was inside a Walmart store in Omaha, Douglas Co through winter and spring 2003-2004 was still present 22 Jun 2004, feeding on spilled bird seed. A female at the Gavin’s Point Dam Visitor Center, Cedar Co for “a few weeks” through 30 Jul 2014 may have actually been an immature male that molted in late Jul; an “adult male” was reported there 30 Jul-1 Aug 2014. High counts: 350 at Branched Oak Lake, Lancaster Co 1 Apr 2018, 300 at Crane Trust, Hall Co 16 Apr 2018, and 200 at Fremont Lakes SRA, Dodge Co 23 Mar 2018. Included here are those juncos unspecified as to form; “Slate-colored” Junco is by far the most numerous form statewide. Migrants arrive statewide in mid-late Sep, and peak movement is in Oct (Johnsgard 1997). The early date above is of one banded 31 Aug 2009 at Wildcat Hills NC, Scotts Bluff Co.
High counts: 250 at Forest Lawn Cemetery, Omaha 28 Oct 2010, 210 in Lancaster Co 14 Nov 1997, 204 in Otoe and Nemaha Cos 3 Nov 2002, and 200 in Omaha 4 Nov 2014. “Hundreds” were in Lincoln Co 2 Nov 2004 and 7 Nov 2007. Winter: Numbers of wintering juncos vary considerably from year to year as pointed out by Rosche (1982) for the northwest, and as shown by CBC data. For CBCs 1984-1985 through 2015-2016, birds per party-hour have been fairly consistently in the 2-7 range, perhaps rising slightly, with peaks 1983-1984, 1990-1991, 1999-2000, and 2007-2008. High counts were 3665 in 1999-2000, and 3603 in 2007-2008. High counts: “thousands” in Howard Co 8 Jan 1995. Cassiar Junco at Papillion, Sarpy Co 12 Mar 2007. Photo by Phil Swanson. Documentation: Specimen: UNSM ZM7401, 30 Mar 1915 Long Pine, Brown Co.
Taxonomy: Subspecies cismontanus breeds from Yukon to central British Columbia and west-central Alberta, wintering from California to Texas (Pyle 1997). Subspecies cismontanus may be a “stable population of apparent hybrids between Slate-colored and Oregon [presumably mearnsi] Juncos” (Rising 1995, Wright 2013), although it is generally identifiable in the field, especially males, which resemble “Slate-colored” Juncos with blackish hoods and on occasion very limited pinkish anterior flanks. Females are similar to some female “Oregon” Juncos, but usually show at least some grayish flank wash, unlike the latter (Wright 2013). Wright (2013) discussed the presence of eight specimens at UNSM of this taxon; three of these were the Long Pine specimen cited above and two specimens collected at Lincoln, Lancaster Co (Moser 1946, AOU 1957). This subspecies usually occurs with Slate-colored Juncos, and so its temporal distribution is similar. There are few data, but as observers become more familiar with it, observations will increase. Winter: Most reports appear to be from the west, south, and east (eBird.org, accessed October 2017). CBC data are lacking. Oregon Junco at Papillion, Sarpy Co 12 Mar 2017. Photograph by Phil Swanson. Status: Abundant regular spring and fall migrant and winter visitor west, common central, uncommon east. Documentation: Specimen: shufeldti, UNSM ZM 10381, 8 Dec 1910 Dawes Co.
Taxonomy: We include the following taxa in this group: oreganus, simillimus, shufeldti, thurberi, pontilis,and pinosus. Ranges of subspecies known or likely to occur in Nebraska (Pyle 1997, Nolan et al 2002) are: simillimus, breeding in coastal coniferous forests from southwest British Columbia south through western Washington and western Oregon, wintering in breeding range south to California and sparsely to southeast Idaho, Colorado, west Texas, and Chihuahua, and shufeldti, breeding central interior British Columbia and southwest Alberta south through northwest Montana, western Idaho (north of Snake River), eastern Washington, and eastern Oregon, wintering chiefly to lower mountains of Colorado, New Mexico, and Arizona, as well as west to California, south to central Chihuahua, and east to eastern Kansas. There has been much confusion over the taxonomy in this group as it relates to montanus and shufeldti. Subspecies shufeldti was renamed J. h. simillimus by Phillips (1961) who pointed out that the type of J. h. shufeldti was actually J. h. montanus (Nolan et al 2002). Browning (1990) retained simillimus as did Pyle (1997), who, seemingly logically, synonymized montanus and shufeldti, as herein, the latter having precedence. Neither Gill and Donsker (2017) nor Clements et al (2016) recognized simillimus, and both retain separate montanus and shufeldti. The discussion regarding shufeldti and montanus is pertinent to Nebraska. There are two specimens at UNSM labeled as both shufeldti and montanus (ZM 10375, 8 Dec 1910 Dawes Co, and ZM 10377, 3 Dec 1910 Dawes Co), indicating the confusing taxonomic environment that existed for many years. Bruner et al (1904) were perplexed also, noting that records of “Oregon Junco” for Nebraska “should probably be placed“ under J. h. shufeldti or J. montanus, but “Just which one is referred to in each case is now impossible to definitely state owing to the extreme similarity of the two species, but it is certain that both are represented”. Of course the recent synonymization of the two (Pyle 1997, Browning 1990) renders the confusion moot. The occurrence of simillimus in Nebraska is as yet undocumented but not unlikely, however, as its range corresponds with other Pacific Northwest taxa that occur in Nebraska in fall, such as Cassin’s Vireo, Townsend’s Warbler, and various subspecies of Hermit Thrush. 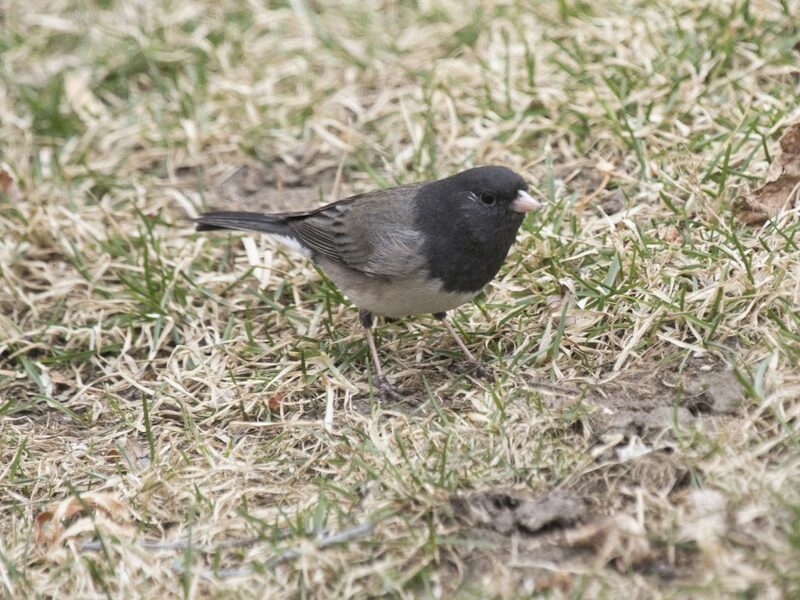 “Oregon” Juncos reported in Nebraska are presumed shufeldti (= montanus). There are later reports 28 Apr 1935 Lincoln Co (Tout 1947) and 30 Apr 1995 Sioux Co. 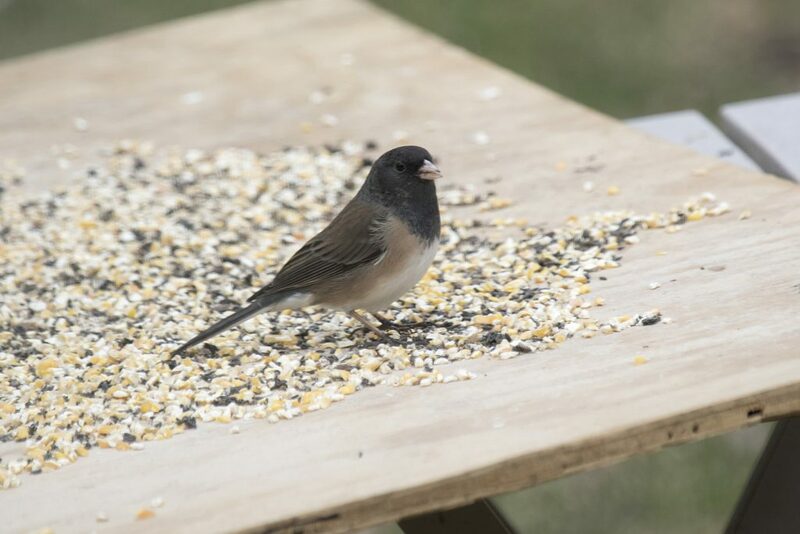 There is an earlier date for “Oregon” Junco 5 Sep 2015 East Ash Canyon, Dawes Co and earlier dates in the east are 24 Sep 2015 Lancaster Co, 9 Oct 2015 Lancaster Co, and 11 Oct 2003 Douglas Co. 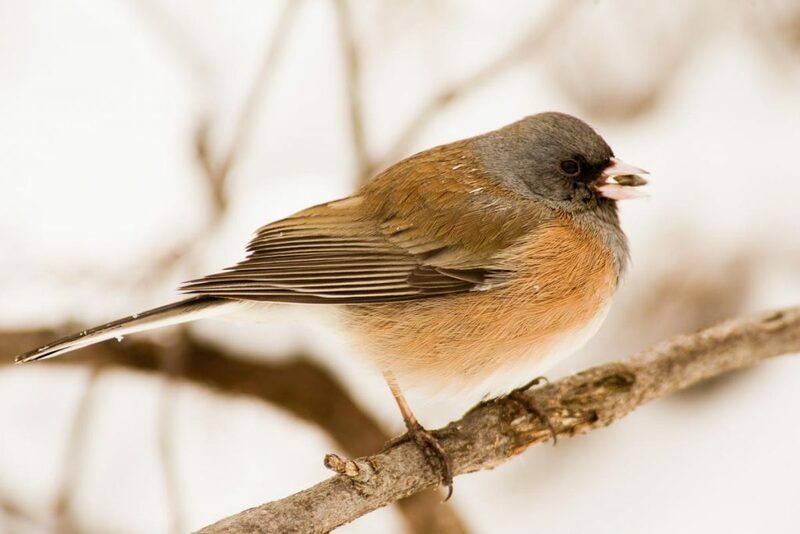 The limited available data indicate that “Oregon” Junco arrives later in fall and leaves earlier in spring than “Slate-colored” Junco, especially in the east. Winter: Rosche (1982) stated that “Pink-sided” Juncos are the most common form in the northwest in winter, followed by “Oregon” Juncos and “Slate-colored” Juncos. A similar mix was reported by Rosche (1994) in the Keith Co area, although Tout (1947) stated that “Pink-sided” Juncos were “not common” in Lincoln Co, and Brown and Brown (2001) noted that most in the Keith Co area were “Oregon” Juncos. “Oregon” Juncos are far more common in the Panhandle than easterly, as indicated in the table above. Banding studies indicated that “Oregon” Juncos comprised about 10% of juncos in the east, increasing to 50% at Alda, Hall Co (Tom Labedz, personal communication). Pink-Sided Junco south of North Platte in Lincoln Co 22 Jan 2007. Photo courtesy of NEBRASKAland Magazine, Nebraska Game and Parks Commission. Status: Common regular spring and fall migrant and winter visitor west, uncommon west-central, rare casual east-central and east. Documentation: Specimen: UNSM ZM7387, 19 Sep 1919 Sioux Co (Mickel and Dawson 1920). Taxonomy: Subspecies mearnsi breeds from southeast Alberta and southwest Saskatchewan south through eastern Idaho, central Montana, and northeast Wyoming, wintering from northern Utah, northwestern Wyoming, and central Nebraska south to Mexico and west Texas. Nebraska birds are mearnsi. There is a later date 29 Apr 2009. Earlier dates are 7 Sep 2000 of one netted at Oliver Reservoir, Kimball Co (Dinsmore 2000), one there 7 Sep 2015, and one netted at Chadron SP, Dawes Co 8 Sep 2015. Tout (1947) stated that “Pink-sided” Juncos were “not common” in Lincoln Co, occurring in the period 10 Oct-22 Apr. Winter: The highest numbers occur in the west (Rosche 1982) but decline rapidly eastward. See CBC data in table above. There are a few easterly records in the period 20 Nov-1 Apr although we believe that most are likely to be of female “Cassiar” or “Oregon” Juncos or of intergrades. The only reports with tangible documentation are of one well-described by an experienced observer in Lancaster Co 3 Dec 2018, one photographed in Knox Co 7 Jan-20 Mar 2017, and one photographed in Lincoln, Lancaster Co 22-27 Feb 2011. Gray-headed Junco at Papillion, Sarpy Co 1 Jan 2000. Photo by Phil Swanson. Documentation: Specimen: UNSM ZM10385, 19 Apr 1911 Red Cloud, Webster Co.
Taxonomy: Subspecies caniceps breeds in the Laramie Mountains of eastern Wyoming (Faulkner 2010). There have been many reports of “Gray-headed” Junco in Nebraska, most undocumented, and it is likely that many of the latter are in fact examples of hybrids between various forms of “Oregon Junco” or brightly-marked examples of mearnsi. Sutton (1975) collected several birds resembling this form in Oklahoma but none were found to be true “Gray-headed Juncos”. 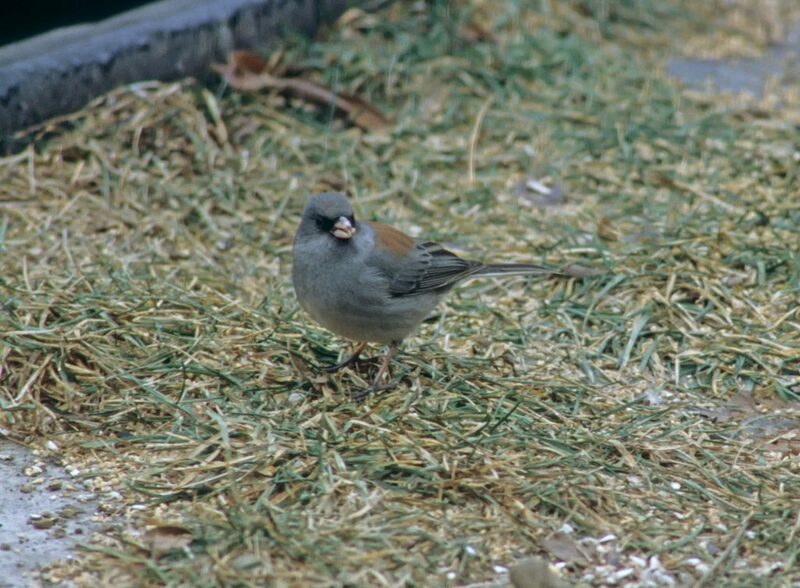 A photograph of a bird in Omaha Mar 2006 shows what appears to be a hybrid between “Gray-headed” and “Oregon” (likely mearnsi) Juncos (Rick Wright, pers. comm. ), a rare occurrence in itself, especially in eastern Nebraska. The 20 records are in the period 31 Aug-5 Jun, most in the west, but these three are from the east: one in a Papillion, Sarpy Co yard 16 Jan-9 Mar 2000 was photographed, one in a Bellevue, Sarpy Co yard unaccompanied by other juncos 2 Oct 1977 was said to be “like the slightly larger juncos of Colorado with the large rufous patch on the back” (Cortelyou 1978), and one hit a window in Lincoln, Lancaster Co 27 Apr 1982, was rehabilitated, banded, and released 18 May (Cortelyou 1982); a report from Lancaster Co 13 Apr 1982 (Williams 1982a) probably referred to the same bird. The remaining 12 records are from the west: 31 Aug-1 Sep 2012 Mitchell, Scotts Bluff Co, 12 Sep 1998 Scotts Bluff NM, Scotts Bluff Co, 18 Dec 2010 Scottsbluff CBC, 20 Dec 2014 Scotts Bluff CBC, 27 Dec 1977 Crawford CBC, 2 Feb 2001 photographed at Riverside Park Zoo, Scottsbluff (Jorgensen 2003), one flew into a garage door near Gering, Scotts Bluff Co 12 Apr 2010 and stayed through 15 Apr, 7 May 2009 Wind Springs Ranch, Sioux Co, two on 8-9 May 2011 Wind Springs Ranch, 19 May 2018 Monroe Canyon, Sioux Co, 22 May 2010 North Platte, Lincoln Co and 5 Jun 1982 at Crescent Lake NWR, Garden Co (Williams 1982b). White-winged Junco in Sowbelly Canyon, Sioux Co 16 May 2017. Photo by Michael Willison. Status: Fairly common regular resident Pine Ridge. Uncommon regular winter visitor west and west-central, rare casual elsewhere. Rare regular spring and fall migrant west and west-central, rare casual elsewhere. Documentation: Specimen: UNSM ZM7366, 12 Dec 1895 Fort Robinson, Dawes Co.
Taxonomy: Subspecies aikeni breeds in a fairly restricted region, including the Rosebud and Long Pine Hills of southeast Montana, the Black Hills and Short Pine Hills of southwest South Dakota, the Bear Lodge Mountains and Black Hills of northeast Wyoming, and northern Sioux Co of northwest Nebraska, wintering throughout the breeding area east to central South Dakota and south through southwest Colorado, north-central New Mexico, western Oklahoma, and western Kansas (Nolan et al 2002). Bruner (1896) mentioned the collection of a specimen of aikeni with “decidedly pinkish sides,” presumably in Sioux Co. This bird may have been a hybrid with mearnsi, which breeds in the Bighorn Mountains of northern Wyoming and whose range approaches within about 20 miles of that of aikeni in western Powder River County, Montana, at a location where extensive interbreeding occurred at one time (Miller 1941). More recently, however, no hybrids could be located in the area, and the current breeding range of aikeni appears to be separated from that of any other junco form (Nolan et al 2002). Mila et al (2007) found that differentiation of the white-winged junco population “could be due to founder events and the subsequent fixation of rare alleles in a population of small effective size, although the influence of natural selection cannot be ruled out. The fact that some pink-sided juncos from the nearby Bighorn Mountains of Wyoming and even some Oregon juncos cluster with the white-winged juncos suggests that the alleles involved appeared (or became fixed) in the small Black Hills population and spread west through gene flow across hybrid zones”. 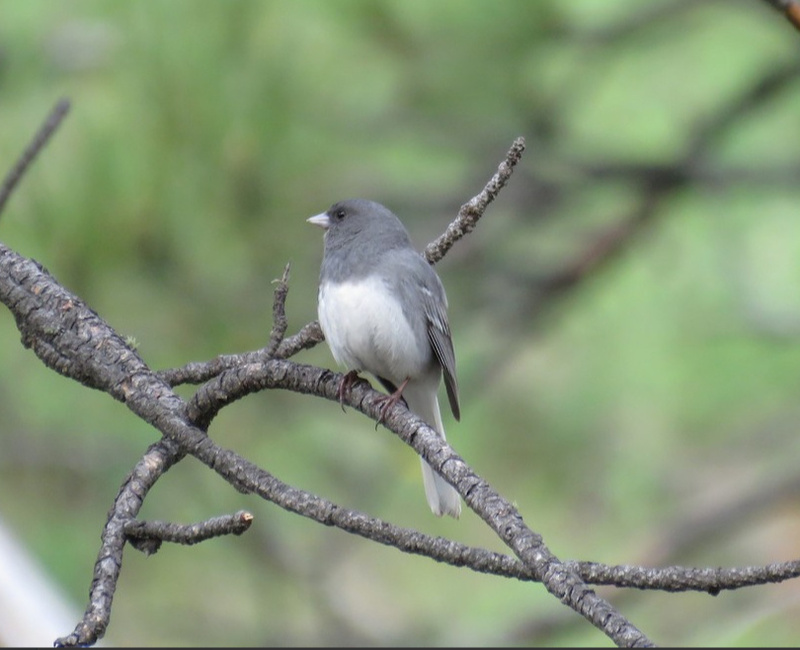 Resident: “White-winged Juncos” are fairly common in summer on the Pine Ridge, especially in the westerly canyons such as Monroe (Rosche 1982) and Warbonnet (Bruner et al 1904). The eastern extent of the breeding range has moved east in recent years; Mollhoff (2001, 2016) showed that between the two atlas periods (1984-1989 and 2006-2011), the range expanded eastward from central Dawes Co to northeastern Sheridan Co.
Ducey (1988) listed a report of breeding in Holt Co in 1901, but no details were provided. Spring: Many “White-winged” Juncos are resident, therefore it is difficult to determine dates of migration. However, birds wintering in Colorado depart by mid-Apr (Andrews and Righter 1992). The only reports for the period Mar-May away from the Pine Ridge suggestive of migrants are of one photographed in Lincoln Co 18 Mar 2013, 20-24 Mar 1940 Lincoln Co (Tout 1947), 26 Mar 2008 Gering, Scotts Bluff Co, 23 Apr 2013 Oshkosh, Garden Co, and 4 May 2016 Crescent Lake NWR, Garden Co. The above dates are for arrival in non-breeding areas south of the summer range. Singles banded at Wildcat Hills NC, Scotts Bluff Co 2 Oct 2007, and 30 Sep and 2 Oct 2009, suggest the beginning of southward movement occurs in late Sep; earlier dates are of one in Banner Co 6 Sep 2018, one in Scotts Bluff Co 12 Sep 2015 and one banded at Wildcat Hills NC, Scotts Bluff Co 21 Sep 2012. “White-winged” Juncos wintering south of the breeding range into Colorado arrive around mid-Oct (Andrews and Righter 1992). The easterly limits of fall migration are unclear; one was in Perkins Co 30 Oct 2004, one was photographed in a Lincoln Co yard 2 Nov 2012, one was at Lake McConaughy 7 Nov 1998, and one was in Lincoln Co 9 Nov 2004. Later dates probably are of wintering birds. Winter records (see below) suggest more wide-ranging distribution than these Fall records however. Winter: Many of the summering birds are resident (AOU 1957), although in some winters there is considerable movement south of the summer range, most notably to Colorado (AOU 1957), where it occurs mid-Oct through mid-Apr (Andrews and Righter 1992). The eastern limit of regular wintering in Nebraska appears to be Keith Co (Rosche 1994, Brown et al 1996). Reports away from the Panhandle are few and generally undocumented. Some, if not most, easterly reports may in fact be variants of “Slate-colored Junco” with exaggerated wingbars (Robbins 2018); aikeni, however, is a larger and paler bird overall than hyemalis. None of five reports from the east are documented. Reports from the central are: 9 Nov-14 Dec 2004 North Platte, Lincoln Co, one at a feeder 17 Nov 2012 Lake McConaughy, 23 Dec 2002 Harlan Co Reservoir, Harlan Co, 3 Jan 2015 Lincoln Co, 4 Jan-9 Mar 2005 North Platte, 5 Jan 2003 Lake McConaughy, 26 Jan 2009 North Platte, 28 Jan 2008 Lincoln Co, 12 Feb 1917 a specimen #2782A in the Brooking Collection taken at Inland, Clay Co (Brooking, Notes), 12 Feb 1957 Logan Co, two on 15 Feb 2005 Brady, Lincoln Co, 22 Feb 1935 Adams Co, and 4 Apr 1955 Keya Paha Co.
Browning, M.R. 1990. Taxa of North American birds described from 1957 to 1987. Proceedings Biological Society Washington 103: 432-451. Cortelyou, R.G. 1982. 1982 (Fifty-seventh) Spring Occurrence Report. NBR 50: 51-67. Mila, B., J.E McCormack, G. Castañeda, R.K Wayne, and T.B Smith. 2007. Recent postglacial range expansion drives the rapid diversification of a songbird lineage in the genus Junco. Proceedings Biological Science 274: 2653–2660. Miller, A.H. 1941. Speciation in the avian genus Junco. University of California Publications in Zoology 44: 173-434. Moser, R.A. 1946. The genus Junco in Nebraska. NBR 14: 1-6. Nolan Jr., V., E.D. Ketterson, D.A. Cristol, C.M. Rogers, E.D. Clotfelter, R.C. Titus, S.J. Schoech, and E. Snajdr (2002). Dark-eyed Junco (Junco hyemalis), version 2.0. In The Birds of North America (A. Poole and F. B. Gill, Editors). Cornell Lab of Ornithology, Ithaca, New York, USA. https://doi.org/10.2173/bna.716. Phillips, A. 1961. Notas sistematicas sobre aves Mexicanas. I. Annal. Inst. Biol. Mex. no. 32: 333-381. Sutton, G.M. 1975. A junco is a junco is a junco. NBR 43: 66-67. Williams, F. 1982a. Southern Great Plains Region. American Birds 36: 868-871. Williams, F. 1982b. Southern Great Plains Region. American Birds 36: 992-995. Wright, R. 2013. The Junco called Cassiar. NBR 81: 87-93.